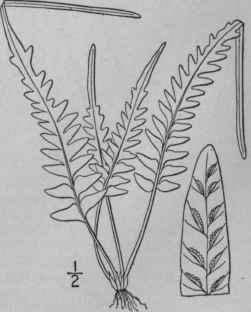 Asplenium ebenoides R. R. Scott, Journ. Roy Hort. Soc. 87. 1866. Rootstock short, chaffy, with dark, shining scales. Stipes tufted, 1 1/2'- 7' long, purplish brown; blades triangular-lanceolate, rarely almost linear, variable in outline and size, 3'-12' long, 1'-3' wide at the base, firm, tapering into a long narrow acuminate apex, pinnatifid, or commonly pinnate below, the segments or pinnae lanceolate from a broad base, acute or acuminate, variable in length, the lower sometimes shorter than those just above; son straight or nearly so; indusium narrow, re-flexed at maturity Rare. Vermont to Missouri, south to Virginia and Alabama, where it is self-perpetuating. 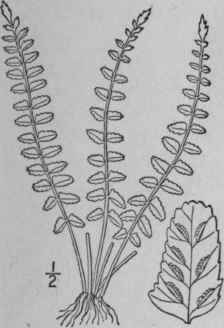 Now proved by Miss Margaret Slosson to be a hybrid between Camptosorus rhizophyllus and Asplenium platyneuron. Ascends to 1400 ft. in Virginia. 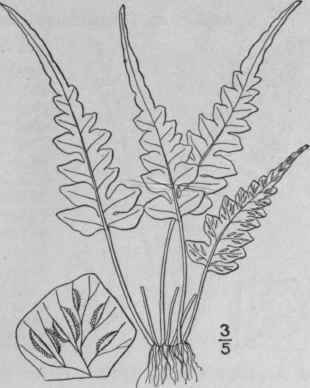 Asplenium pinnatifidum Nutt. Gen. 2: 251. 1818. Rootstock short-creeping, branched, conspicuously chaffy, with firm lanceolate dark brown iridescent scales. Stipes often densely clustered, polished, dark brown below, greenish above, 2'-5' long; blades 3'-10' long, rigidly herbaceous or coriaceous, narrowly deltoid-lanceolate, tapering upward to a long narrow or filiform sinuate apex, deeply pinnatifid or the lower parts pinnate, the basal pinnae or occasionally several pairs sometimes long attenuate like the apex; lobes or pinnae rounded or the lowest acuminate; sori commonly numerous, straight or slightly curved, copiously confluent with age. On rocks, Connecticut and New York to Missouri, south to Georgia, Alabama, Arkansas and Missouri. Ascends to 3000 ft. in North Carolina. July-Oct.
Asplenium parvulum Mart. & Gal. Mem. Acad. Brux. 155: 60. 1842, not Hook. 1840. Asplenium resiliens Kunze, Linnaea 18: 331. 1844. Rootstock short, creeping, chaffy with black stiff scales. Stipes tufted, blackish and shining, 1'-2 1/2' long; blades firm, linear-oblong or linear-oblanceolate, 3'-10' long, 5"-12" wide, once pinnate; pinnae 2"-6" long, mostly opposite, oblong, obtuse, entire or crenulate, auricled on the upper side or sometimes hastate-auriculate, nearly sessile, the middle ones the longest, the lower gradually shorter, distant and reflexed; rachis dark brown or black; sori oblong, short, nearly or quite straight, borne rather nearer the margin than the midrib, often strongly confluent with age and appearing, as a broad submarginal band. On limestone, Virginia to Florida, west to Kansas, Texas and New Mexico. Ascends to 2400 ft. in Virginia. Also in Mexico and Jamaica. June-Oct. Called also Little Ebony Spleenwort.